TG Top 50 coach and Birkdale Head Pro Brian Hodgkinson talks you through the four key shots players will need at Royal Birkdale for the 146th Open. From getting out of the 120 tough bunkers to keeping it under the wind with your drives, Brian offers his advice on how to negotiate the links course. The 11th, 15th and 16th are three key driving holes where you should only be concerned with getting the ball in play. And in a prevailing wind, all three play longer than the scorecard suggests. People often make the mistake of teeing the ball low to keep the ball low. But that actually steepens the angle of attack, creates more backspin and balloons the ball up into the air. To achieve a penetrative flight, tee it up higher and try to take the ball cleanly so the peg stays in the ground. Concentrate on swinging shallower and compressing the ball at impact, rather than hitting down on it. To create a more stable base in windy conditions, widen your stance and swing within yourself. For added control, grip down the club by an inch to lessen the hand action. There are more than 120 bunkers on the course, and in some cases, it can be dif cult to see over the face, so the aim is to get the ball up as quickly as possible. The trick is to let the loft do the work. At address, set the face open until the back of the club is facing the sand and are your front toe out so you can clear your hips. The idea is to feel like you’re keeping your chest over the ball so the bounce can cut through the sand and get the ball to grip on the green. If your ball lies on a slope, don’t fight it or work against it. Simply set your body parallel to the slope so you can swing along it. That way, your swing path will remain shallow and you’ll hit the ball on an upward trajectory. Don’t fall into the trap of trying to “scoop” the ball into the air. If you lean back and push the handle to the target, you will present the leading edge and catch the ball thin. The main defence of any Open course is the long, wispy grass which surrounds the greens and fairways. Just getting out can be a hazard in itself, especially if the shaft gets tangled up in the rough and closes the clubface. To allow for this, rotate the face open slightly at address and exaggerate the amount of hinge in the takeaway with an early wrist break. This will help to steepen your swing plane and will minimise the amount of grass getting caught between the face and the ball at impact. To get the club moving through longer grass, cup the lead wrist during the backswing. This will add additional loft to the face and lend itself perfectly to the cutting motion we are trying to achieve. If the ball is embedded or the grass is growing against you, don’t try to be too cute. Just focus on getting the ball out by taking as much loft as you can and gripping harder than normal to stop the clubhead twisting. 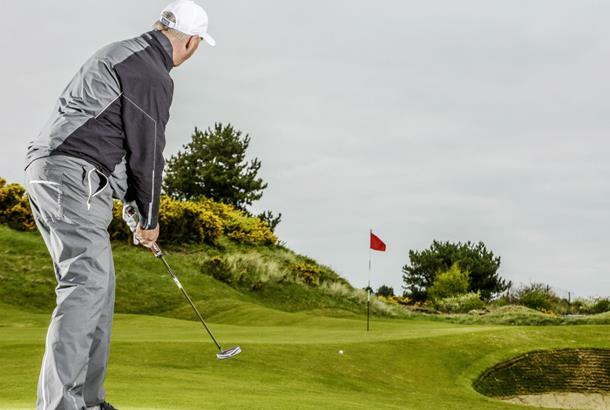 The safe and smart play is to pull out the putter when you’re just off the green. It’s not a cop out – it’s a less riskier option than chipping with a wedge, especially if you’ve got a small landing area. To play the shot, move the ball slightly forward in your stance and then push your hands slightly behind the ball so they point towards your belly button. This will add a couple of degrees of loft to the face, which will help to lift the ball over the longer blades of grass and achieve a truer roll. Think of increasing the size of the pendulum, rather than the speed of the stroke. Limit the wrist action and try to marry the length of the backswing and follow through by rocking the shoulders. Brian has been attached to Birkdale since 1980 and will oversee his fifth Open this year.